If you've never flown before, the whole air travel experience can be a daunting one. It can be even more nerve-wracking if your flight includes a layover. 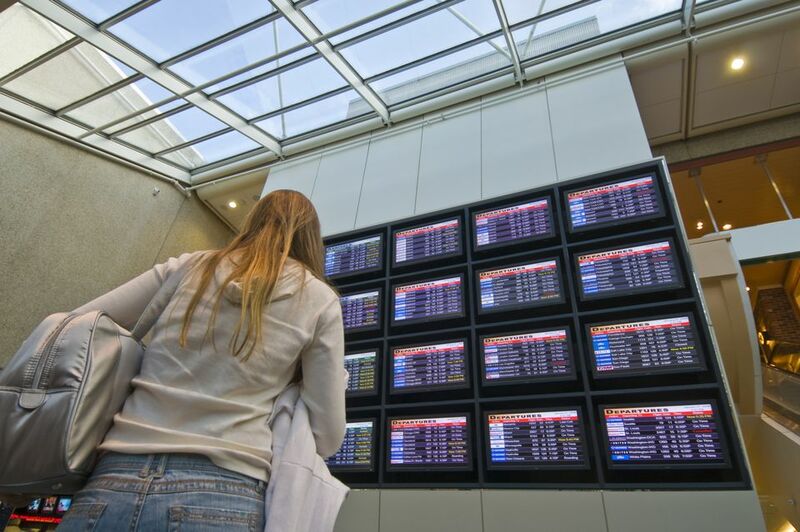 Fortunately, there's no need to worry—layovers are easy to navigate and are even something you may want to look for as you travel. A layover is when you have to change planes part-way through your journey. For example, if you bought a flight from New York City to Los Angeles and it had a layover in Houston, you will have to get off the plane in Houston and transfer to a new plane at the airport there. You then board the next plane and fly to Los Angeles. Layovers therefore add time to your journey, but if your layovers are long enough, you can use that time to leave the airport and explore a brand new city. The difference between a layover and a stopover is the amount of time you spend in the place that isn't your final destination. For domestic flights, it's called a layover if it's less than four hours, or a stopover if it's longer. In general, you can use the two words interchangeably, or even use the word "connection" for a short-term stop, and everyone will know what you mean. Layover is the more popular term, especially in the United States. If you're flying internationally, a layover is said to be a stop for less than 24 hours, whereas a stopover is defined as spending more than 24 hours in a city. For most people, layovers are unpleasant, and they'll pay more for direct flights. For travelers who are more budget-minded, layovers are a great way to save money. Airlines will usually lower the prices of flights with long layovers, making it easy to pick up a bargain. If you don't need to get somewhere quickly, it's worth picking up a flight with several stops to save money. Layovers can also be a great way to discover a new destination. Whether it's heading into Paris for three hours to grab a baguette and cup of coffee, or a night of partying in Bangkok, layovers are a fun way to check out a new city to see if you'd like to return in the future. Layovers are something you should look for when booking a long flight, especially when traveling internationally. For example, both WOW air and Icelandair offer stopover programs, which allow Americans traveling to Europe a free layover in Iceland (for an unlimited amount of days). Every country and airline has different rules on this, so it's best to do some research beforehand if you're unsure of how your layover will work. For the most part, though, following everyone else who gets off your plane is a safe way to know you're doing the right thing. In general, if you're on a domestic flight, once you land for your layover, you'll pass through a transfer area that will take you to the gate for your next flight without having to check in again. Your bags will automatically pass through to the next flight without you having to collect them. This also often happens on international flights if you're flying with the same airline. When you check in for your first flight, ask the person who is checking you in if your bags will be checked the entire way. If they are, you don't need to worry about going to the baggage reclaim and can pass directly to your next gate, safe in the knowledge that your luggage will be making the journey with you. If you're flying with two different airlines and flying internationally, you will most likely have to collect your bags, pass through immigration to enter the country, and then re-check-in for the next flight. Make sure you check the visa rules of the country you'll be transiting for, as you could be refused entry if you don't have a transit visa in advance. When you're flying into a country like Malaysia or the United States, all passengers have to pass through immigration and check in again for their flight, whether they're flying domestically or internationally. In this case, make sure you have plenty of time (at least two hours) to make your next connection. During your layover, you will have to go through airport security at some point. If you need to pass through immigration, as you do when you fly through the United States, you'll go through security when you check-in for your next flight. If you don't need to go through immigration, you'll most likely have to go through security when you arrive at the gate before your next flight. A transit visa is one that permits you to stay in a country for a short amount of time—typically between 24 and 72 hours. They're usually easy to apply for and inexpensive, and a great way of getting to see a place during your stopover. Fortunately, many countries will give you a visa on arrival, which makes it even easier to explore, as you won't have to apply for anything in advance. If you are planning to spend some time in your layover destination, check the country's visa regulations before you book your flights. Several countries do require that you apply for a transit visa in advance in order to leave the airport, so you'll want to make sure you have enough time to do so. Download These 15 Air Travel Apps Now! How to Keep Your Hard-earned Money for Travel, Not Luggage Fees.